Lately I’ve been trying to find ways to eat more veggies—which I realize may sound a bit funny coming from someone who eats plant-based—but it’s all too easy to get into ruts, especially when things are busy. It’s just so convenient to grab something from a box sometimes! Pregnancy also makes my food obsessions and aversions much more pronounced, and trickier to navigate on a day-to-day basis. I’ll love something one day and loathe it the next (except cookies…I constantly have to resist the urge to bake cookies). There’s a virtual stack of recipes that I’ve developed this year and totally loved at the time, only to want nothing to do with them the next day. It’s been a bit frustrating as a recipe developer, feeling so hot and cold about my usual favourite foods. In an effort to up my veggie intake, I made a pledge to myself on my birthday this past Monday to consciously set aside some time each day for veggie prep. That morning, feeling super inspired, I threw all the healthy ingredients I had into the blender. Usually when I toss all kinds of random things in, it comes out tasting like utter garbage, but I think birthday magic was on my side because this smoothie blew me away. Afterward, I wrote down my best guess of the “recipe”, tested it in the afternoon, and was shocked to discover I’d pretty much nailed the smoothie’s proportions. The best part is that this recipe makes a huge batch—enough for a big serving in the morning with breakfast (I love pairing it with avocado toast), and another as a snack in the afternoon. It also keeps well until the next day (which I think is due to not having any banana in it! ), so you can save the other half for the next morning, too. I love knowing that I’m getting in so many extra veggies throughout the day. 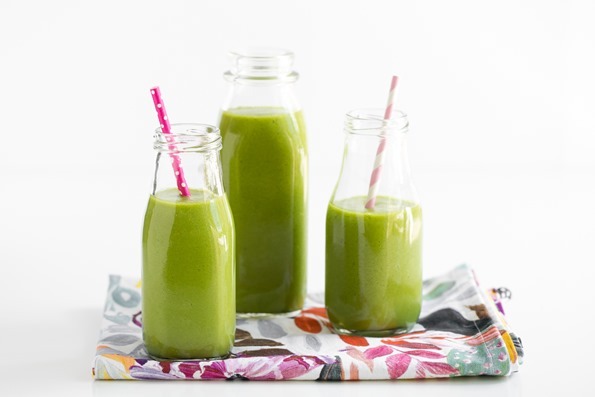 You can’t go wrong with 5 cups of green smoothie ready in about 10 minutes. Fresh turmeric: Anti-inflammatory and fights free radical damage to the brain. It contains curcumin, which is a powerful antioxidant. Also has pain-relieving properties. Cilantro: Detoxifying and helps remove heavy metals from the body. Also antibacterial, immune-enhancing, and aids digestion. Parsley: Diuretic aid rich in antioxidants. Contains vitamin K, which helps support healthy bones. Red Leaf Lettuce: Source of folate and soluble fibre. The deep pigment in red lettuce leaves means that it contains an extra boost of antioxidants. The watery nature of lettuce helps flush toxins from the body. Also thought to have a calming or sedative effect on the body. Lemon: Antibacterial properties. High vitamin C content. Lemon boosts digestion and is alkalizing and detoxifying. Avocado: Contains healthy monounsaturated oil. The flesh and oil are anti-inflammatory. Also thought to help keep joints supple and may boost fertility. Mango: High in vitamin C and beta-carotene, which can help boost the immune system. Contains prebiotic dietary fibre, which helps feed good bacteria in the gut. Impressive, to say the least! I hope you all enjoy it as much as we do. This refreshing and tangy smoothie happened by total accident. I created it on my birthday as I was looking to feel my absolute best, and I had resolved to eat more veggies in the year ahead. So I threw in all of the healthy ingredients I had lurking in the fridge, and I was absolutely astounded by how delicious it turned out. I'm not sure if I've ever created such a powerhouse smoothie before! 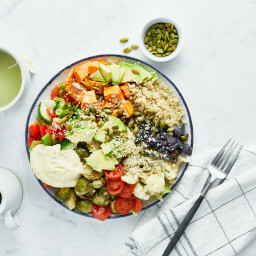 This one is jam-packed with nutritious ingredients like fresh turmeric, cilantro, parsley, lemon, avocado, green apple, lettuce, coconut water, and more. Keep in mind this is a large batch that just fits in a 64-ounce high-speed blender, so if your blender is smaller you might want to make a half batch. I love to have a glass first thing in the morning, and another in the afternoon. Since there's no banana in it, it also keeps well until the next day when stored in an airtight container. 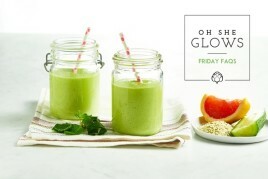 Be prepared to feel that "all-day" glow!! Now add the rest of the ingredients. Blend on high until super smooth. If you have a Vitamix, use the tamper stick to get things moving. Taste and adjust sweetness if desired. If it's too tart, feel free to add a bit of liquid sweetener. Recipe makes 5 cups total. Nutritional info is for 1 of 2 servings. * The cilantro flavour in this smoothie is quite pronounced. If you aren't a cilantro fan, feel free to swap it with more romaine or fresh mint (start with 1/4 cup of mint). ** Fresh turmeric root is becoming more and more common in grocery stores these days; keep your eyes peeled for it in the produce section. It can also be found on Amazon, and in select health food stores and Indian and Asian grocery stores. Look for firm turmeric that is unblemished. Oh this green smoothie looks and sounds amazing. I have been using the turmeric root especially in hot tea this past winter, and I use it more and more often now. It’s so good. By the way, I love your app, Angela! Congrats on its release. Thanks for the congrats, Lynn! I’m so happy to hear you’ve been loving the app. I hope you enjoy the smoothie if you give it a try! Hi Angela! I’ve been following you for about a year now and love your recipes, your little stories, and your take on life! I even started a blog of my own which along with some of my own recipes, features my progress as I cook ALL the recipes from your cookbook. 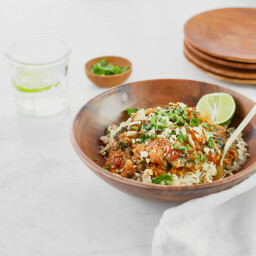 You’ve liked a few of my Tweets on the subject, which was such a thrill for me :) This week is the last week of my self-titled “#osgcookbook challenge” and I’m super excited – just 3 recipes to go! I wanted to ask you – do you have any suggestions for substitutes for the apples in a lot of your smoothies? I have an allergy, so I’ve been using pears, but I’d love to explore other options. Thanks in advance! Use pears here too and they work well (just because I have a high-producing pear tree though) No allergies to apples. Anyhow, I’m so glad you mentioned the avocados boost fertility, huuuuuge issue for me and I’m trying to eat the fertility diet to increase my chances. If there are any other foods that might help me, please let me know! Love the cilantro and parsley in here….always looking for more ways to incorporate nutritious herbs in my diet. Hey Ashley, I’ve been following your #osgcookbook challenge for a while now, and I’m super impressed by all the dishes you’ve made and shared! Thank you so much. I hope that even more people find your challenge now, and are inspired to do the same. As for subbing apples, I think pears are a great swap, but if you want to mix it up you can try changing up the flavours with mango, peaches, oranges, plums, grapes, or berries. Each fruit will change the flavour of the smoothie, so it kind of depends on the recipe, but I don’t think you can go wrong with any of those really! Let us know what you come up with. Hi Angela! I just wanted to point out, since I imagine there are a lot of new and expectant mothers following you, that for women who already have low-supply issues with their breastmilk, intake of parsley and mint can further impact milk production. You may want to make a note that breastfeeding mothers should leave out the parsley and mint if they have any concerns about their supply. Which reminds me: any plans to do your own lactation cookie/smoothie/bar recipe?? Congrats on your growing family! Thanks for sharing that, Vanessa! :) And I would love to make some lactation-friendly recipes in the future! The one I relied on the most during my first breastfeeding experience was my Flourless Thumbprint Cookies (the oats and flax are great!). I totally agree, if you don’t make an effort it’s hard to get in lot’s of fresh vegetables each day. Green smoothies are my favorite way to get in vegetables fast. I love that this recipe uses a wide variety of veggies. I’m not usually a fan of cilantro in smoothies- sometimes it reminds me of drinking salsa, but I’m going to give it a try! Thanks for sharing – beautiful photos! Happy Birthday! Only the very best of wishes and thoughts coming your way for the exciting year ahead! Tried this today! Have been drinking it throughout the day. I mad mine with the mibt option and it is refreshing and sweetly “green” in flavour followed by the sweet mango flavour. The texture is creamier than I expected and I am loving this smoothie! Time to go see if I’m glowing…? This looks divine! Can´t wait to make it. You´ve really got a little bit of everything in there! Yes, I totally get the pregnancy food obsession thing. BTW, I LOVE your cookbook and am hooked on your recipes! Happy glowing birthday! Thank you so much for the birthday wishes! :) I hope you love the smoothie when you give it a try. Putting this on my must-make list for the weekend – thank you! And where did you find that adorable tablecloth/napkin/towel in the photos…love it too! Just a hint: the effect of turmeric can be boosted and potentiated by adding a litte ground black pepper and even more by adding some good greases, oils or (nut) butters. Pepper is a great idea Chantel. Just a punch and bioavailability properties of tumeric S curcumin skyrocket. Thanks for the tip!! Hi Angela. Happy belated birthday! And thanks for posting this smoothie recipe. I am definitely going to try it. I am not keen on mango, though (I know, my loss!) so is there another fruit that would work just as well to replace the juice and the mango chunks? Hey Janet, Thank you for the wishes! I would suggest frozen pineapple instead of mango. Let me know if you try it out. Hi Angela. That’s a great idea! I love pineapple so I’ll test it out and will let you know what I think. I’m guessing it will be delicious! Happy birthday Angela! 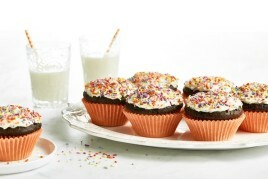 :) This recipe looks really good, I’ll be making it for breakfast this morning, thanks! Happy birthday Angela nice recipe have learn a lot thanks for sharing. This smoothie looks great – I need to venture out as I do the same smoothie daily. It is interesting what you said about the bananas as I always put 1/2 banana in my smoothie and when I go away I will make smoothies ahead of time to take with me….and they are always good. Not sure why…. 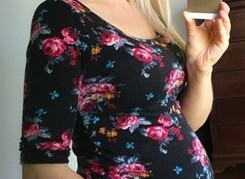 I am in the early stages of pregnancy and I fear I am not getting enough veggies either! XD Right now I am blaming my wallet, I keep budgeting my grocery trips and only letting myself get so much produce. That should change soon since I am part of CSA and we pick up our first share at the end of the month… then I will have no choice but to eat tons of veggies or they go bad. This smoothie looks amazing! Thanks so much for sharing. Just found your blog and excited about this recipe and others. Your pictures make me feel like the bottles are on my table ready to pour and drink. I live in Hawaii and shopping for anything here can be difficult. Please let me know what your bottles are called, where I can order them and do they com with covers since none are pictured. Mahalo and Happy Belared Birthday! Hey Jackie, They are actually from a juicery in Toronto called Greenhouse Juice Co. I don’t think they will ship all the way to you unfortunately, heh. Hopefully you can source something nearby! This looks great! Could fresh/frozen mango chunks be used instead of mango juice? How much chopped mango would you suggest? Loved this! I usually love my smoothies with frozen banana, but this smoothie was delicious without it. The granny smith apple and the mango together were really stellar. 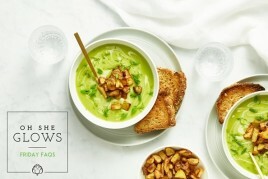 The addition of the avocado made it extremely creamy. This is my new go to get those extra greens in. I’m glad you enjoyed it, Emily! Thanks for the lovely comment. “I have to resist the urge to bake cookies on a daily basis.” That’s pretty much me every day hah. This smoothie looks fantastic! I too occasionally throw whatever I have on hand into my juicer or blender (but less because I’m inspired, and more because the veggies/fruits are past their prime and I want to use them before they go bad), and it definitely doesn’t come out as well as I had hoped. I drink it, but I sometimes have to chug it down. This looks so refreshing-I can’t wait to try it! This looks lovely! I just got back from a holiday where the vegan eating possibilities are quite meager (or even healthy eating possibilities), and this looks like just what I need after surviving on a vegan but rather unvaried diet. One question, I am not very fond of lettuce in my smoothies (although this one has got so many ingredients I might not even taste it? ), and I was wondering if I could swap the lettuce for cucumber? As I’m trying to picture it, it should be fine, but maybe you’ve got some experience with this? Thanks for this lovely, veggie-laden recipe, and I hope you’re doing well! Hey Evelyn, The lettuce flavour is noticeable, but I wouldn’t say overly so. I think the parsley and cilantro are much more pronounced! That said, I think the cucumber would add much more water to this smoothie, so you might only need half the amount, or even less. Maybe add it slowly? Let us know how it goes if you try it! Hi Magda, I haven’t tried it yet, but I would start by using 1/4 teaspoon of ground turmeric. Taste it, and add another 1/4 teaspoon, if you like! I find the ground stuff is pretty potent tasting compared to using fresh, so I use a lighter hand for sure. I hope you enjoy it! Hi Angela, I had heard about Oh She Glows from so many different people that I had to google and check out your blog. What an amazing resource, and as a photographer myself (underwater stuff mostly), I really appreciate the beautiful photos that you take and feature with your recipes. I tried out your green smoothie this morning and LOVED it! Unusual ingredients but oh so delicious and easy to make. I look forward to trying more of your healthy recipes! This recipe IS divine! I have made it several times and am thriving on it. Just wanted to share that tumeric needs oil to enhance absorption, so don’t omit the avocado!! It came out great! I especially loved the cilantro flavor. I’m going to the store tomorrow to buy more ingredients so I can keep making this :) Thanks for another great recipe! I have to admit, the first time I tried this I wasn’t sure I’d be able to finish the batch. But by the end of the day I was thinking it wasn’t so bad (knowing how incredibly healthy it was) and now I’m on my 3rd time making it and thinking how good it is. Just wanted to let others know to try sticking it out for a bit if it’s not love at first sip :). Will make one today. Thanks for the recipe. I hope you enjoy it if/when you give it a try, Ana! I am drinking this smoothie right now, for the first time. I love it. Because I am allergic to banana so many smoothies are off-limits for me, or else I have to figure out a substitute. This one is a perfect way for me to get all sorts of healthy goodness without taking the time to come up with a workaround for the banana. I was at an amusement park on Saturday and on another day trip yesterday, and I pretty much fell off the nutrition wagon. 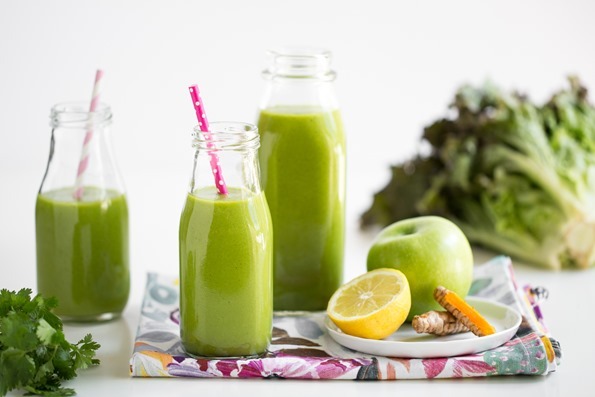 Today this smoothie is my detox, for both breakfast and lunch. Thank you for all of your hard work and your wonderful recipes. You and your efforts are greatly appreciated. I LOVE THIS SMOOTHIE. 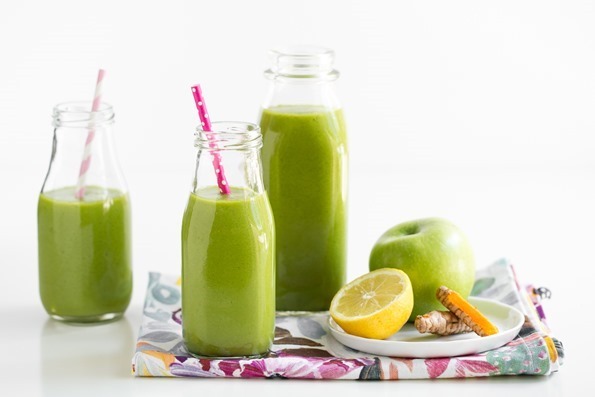 Sometimes I get tired of the “typical green smoothie” taste that can be strangely sweet (usually because of a banana or some almond milk or spinach in the mix)… but this! With the mango and romaine and the parsely-cilantro combo. Wow, unique. This is sweet in a cleaner way, yet slightly spicy, and yet surprisingly green-y. Also– to make life easier in the mornings, I’ve started chopping all my greens the night before and placing them in a bowl in the freezer to use the next morning. This has been helpful on more than one level. I’m glad you’re enjoying the smoothie recipe, Samantha! Great idea about chopping the greens the night before. Sounds like an amazing time-saver! I don’t digest avocados well (sad, I know). Have any substitutes to recommend? I like the idea of the greens and veggies and this sounds awesome. I try and have a green smoothie each day, especially at the moment in Winter to help fight off colds. This one sounds delicious! I love following your recipes! I hope you love this recipe, too, if you give it a try, Shanai! Hi Angela, I would like to ask you about yoghurt? I am totally plant based apart from my no fat greek yoghurt which has 21 g of protein and 4g of sugar. I cannot find a store bought vegan alternative that has nearly the same protein and as little sugar. Do you know what a home made yoghurt might have? I eat it every day for breakfast, with oats and blueberries, I don’t want to change my breakfast I’m afraid… Any thoughts? This is exactly what I needed. The flavors are amazing – almost as amazing as I feel after drinking this magnificent creation. If health had a flavor, this would be it! Even in my crummy, 15 year old blender, I was able to blend this to perfection. For those of you with an older, less fancy blender, I would suggest blending the liquids and the greens first, then the solid stuff. Thank you for this! Thanks for the suggestion, Amanda – and the awesome comment! So glad you enjoyed the smoothie. First of all a belated ‘Happy Birthday’ and secondly, Congrats as your family is getting bigger! I consider myself lucky that I came across your site. I’ve a bias for veggies and especially, green smoothies. Your smoothie looks celestial, I’m sure so will it taste. I just can’t wait to give it a try. Will come back to share my experience in the next comment. Until then, cheers! Yes!! 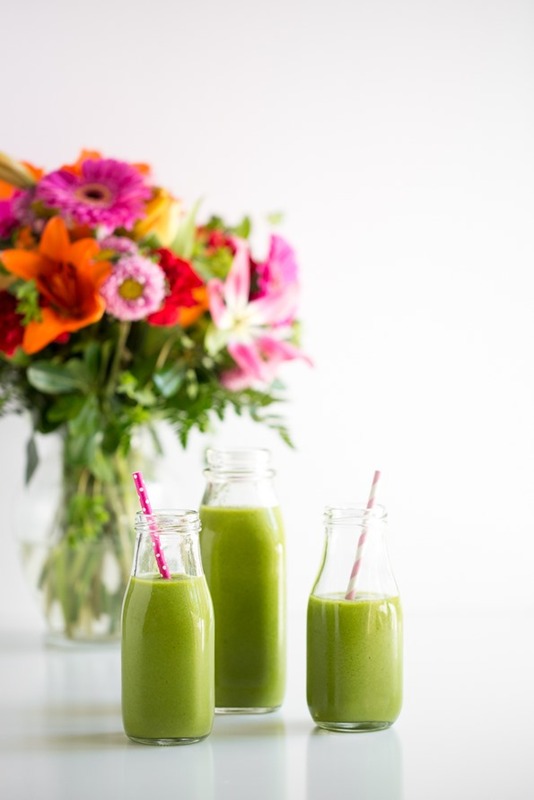 I’ve been looking for new green smoothie combinations and this recipe looks incredible! Hey Sarah, I hope you like this one if you give it a try! Wow! Had to try it. Delicious! Felt like I gave my body a boost! Will continue making this smoothie. Thanks so much !!! I tried this at home and my wife really loved it and she got impressed with me.Once again thanks for the idea! I’m glad it was a hit!! Hi! I have recently discovered your blog and have two of your cookbooks and from the recipes I have tried I am in love! I am big into smoothies right now, but cannot eat banana or avocado. I have noticed all your smoothies recipes contain one or the other, do you have any substitution suggestions? Hi Nicole, Thanks so much for your support for my cookbooks and blog. As to your question, it depends a bit on the smoothie. Did you have a particular smoothie in mind? Sometimes mango is a good alternative, as it adds that bit of creamy thickness back in (and sweetness, too, if it’s the banana you’re omitting). Other frozen fruits that go well with the smoothie’s flavours, or a bit of coconut cream, can also work well as alternatives for bulking a smoothie up. It really depends on what flavours you’re working with/aiming for! Hope this helps. I am sensitive to mangoes – what would be a good replacement for their tangy edge? Thanks for all the nommy recipes. I am Gluten free, dairy free, and nightshade free – finding recipes is a challenge. So Glad I found your site. Hi there! I’d suggest trying some frozen pineapple instead of mango. If you test out that swap, please let me know how you like it! Loved this smoothie. There are so many layers of fresh taste. btw your website and books are my references for all my cooking! Loved this smoothie! My first adventure into green smoothies and it’s so fresh and delicious! Love that it’s banana-free too as I’m not a fan of them! Thank you! From last two months, I started to drink smoothies. And day by day I can’t live a day without a glass of smoothies. I will try this one for sure. Thanks, Angela! Love this smoothie although I don’t add cilantro, like you said.. I am not a fan but really good recipe thank you Angela! Hello Angela! Thank You for your recipe.I love veggies. After my workout i always try to eat something like green smoothies or vegetables and i will definitely try your recipe! Hi – I put this smoothie on my meal plan for next week and wondered if you could suggest a substitute for parsley? It’s the one herb I don’t do well with. Thanks! Hey Chan, I think fresh mint would be a fantastic swap! Although I probably wouldn’t add a full 2/3 cup…maybe start with 1/4 cup of fresh mint? Can I use silken tofu in place of the avocado? (I’m allergic). Do you know if it will keep in the fridge like the basic recipe? Hey Audrey, Oh good question! I haven’t tried silken tofu in smoothies before. Does it tend to blend up into a creamy whipped texture? if so, it just might work okay. I would start with a smaller amount and add to taste rather than all at once just in case the flavour overwhelms the other flavours. I’ve also never used or indeed heard of using silken tofu in a smoothie recipe. I have however, taken your advice and tried this for myself. To my amazement this recipe is nothing short of beautiful. Now I have to share with all my family! Sometimes I should learn to keep things to myself :) Thanks for this Angela. Love this smoothie although I don’t add cilantro like you said. I am not a fan but really good recipe thank you, Angela! Am so happy to have found this recipe! After eating lots of rich foods on vacation, I needed a reset. This is a delightful smoothie, with a fresh, light, vibrant flavor. The slight sweetness added by the small amounts of mango juice & chunks is nicely balanced by the lemon juice, fresh turmeric, and green herbs. I actually dislike most green smoothies, but found this one delicious because the overall flavor profile is still slightly sweet, but that invigorating herbal quality is there too. The creaminess added by the small amount of avocado completes the package. I can tell it will be a go to. As I was making it, I admit I wondered whether or not it was worth dealing with so many ingredients, but it absolutely is. I made it 100% according to the recipe and used my small (40 ounce) Vitamix. Appreciated the advice to make in batches, due to to the smaller size of my blender. I added a banana : ) because I absolutely love bananas in everything always have a ton frozen in the freezer. I recently found out I have quite a few food sensitivities, your website and your app have been a life saver. Hey Miranda, You definitely can’t go wrong with a banana thrown in! Thanks so much for your kind words. I hope 2018 is off to a great start for you! Hi Angela! I have loved your recipes and cookbooks for awhile now! The overnight oats are a household favourite! 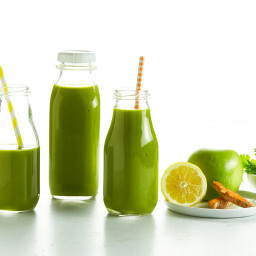 I recently started having green smoothies and I have never felt better, except for the last few days where I have added coconut butter/manna into my smoothie for added protein because I was feeling hungry after having my green smoothies, except recently I started noticing a sore throat after the coconut in the smoothie (I do not have any food allergies). Any thoughts on this? I would love to continue having the green smoothies but without the hunger and sore throat! Hey Chelsey, Oh that’s strange for sure! Have you noticed this with other coconut products before? Maybe try leaving it out and seeing if that makes a difference? Thanks by the way for all the recipe and cookbook love! I’m so happy you enjoy them so much. My wife and I love the recipe! Wasn’t sure how the parsley leaves would fit the taste of other fresh fruits but it turned out very delicious! Love your photography. Can you tell me what camera you use? Do you use an external flash? Love your website. Thanks Becky! I have a Canon 5D Mark III and the lens I use most is a Canon 100mm (2.8) macro. I don’t use an external flash. Hope this helps!! Previous post: Friday FAQs: Freezing soup, storing kale chips, nutritional info, and more!